GREENVILLE – Alice Grace Sawyer, 80, passed away on Nov. 20, 2018 following a long battle with Alzheimer's. She was born on Sept. 26, 1938 and grew up in Athens, Maine. Alice graduated from Somerset Academy in 1956, the same year that she married her high school sweetheart, Hartley. They raised three children together with Alice always focused on family as the center of her world. After marrying, Alice lived in Hartland, Maine for several years, surrounded by lots of friends and family. She then lived in Waldoboro, Maine for a number of years before moving to her long time residence of Greenville, Maine. 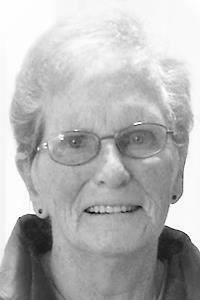 For many years, she worked as a local store clerk where patrons adored her friendly, caring personality. She volunteered at the Union Church thrift shop and spent countless hours tending to her vegetable and flower gardens. More than anything, Alice enjoyed spending time with family and friends. She had a way of making everyone feel special and accepted. She was an amazing baker, homemaker, wife and mother. Truly, to know her was to love her. Alice is survived by her son, Steven Sawyer; daughter, Trudy O'Neil, and her husband, Bill; daughter, Holli Boccelli, and her husband, Adam; grandchildren Nicole Bedard, Eric Arsenault, Toni Rockwell, Taylor Sawyer, Lucas Boccelli, Dylan Sinclair and Delaney Sinclair; great grandchildren Oria Bedard, Anna Arsenault and Jamison Rockwell; brother, Richard Patterson; sisters, Marguerite Libby and Gloria Frederick; and several nieces and nephews. Alice is predeceased by her husband of 57 years, Hartley Sawyer; her parents, Frederick and Genie Patterson; and her sisters Marie Small and Greta Hayden. A celebration of Alice's life will be held at the Union Church in Greenville on Saturday, Dec. 1, 2018 from 12 p.m., noon-3. p.m. Alice will be laid to rest in a private burial service at the Sawyer family plot at the Pine Grove cemetery in Hartland, Maine. In lieu of flowers, the family suggests donations to the of Maine.